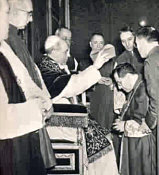 (L-R) May 17, 1946 Papal Bulla of Christ's Vicar Pope Pius XII, with His Excellency Giuseppe Siri's name written in it (three days prior Bishop Siri had been promoted by the Pope to the metropolitan see of Genoa i.e., named Archbishop of Genoa on May 14, 1946); Cardinal Siri pictured receiving the red biretta from Pope Pius XII in Rome, January 12th, 1953; A Cardinal on the move, His Eminence, Giuseppe Cardinal Siri at the Ospedale Galliera (a Hospital in Genoa of which he was the President) c. 1957; White smoke billowing forth from the chimney of the Sistine Chapel on October 26, 1958 for a full five minutes (which was witnessed by more than 200,000 joyous Catholic Faithful in St. Peter's Square) indicating that a Pope had been elected from within the conclave. Millions of others listening via radio throughout Italy and Europe heard the Official Vatican Radio broadcaster shout exultantly: "A pope is elected! "; June 14, 1988 historic picture of His Holiness Pope Gregory XVII with Rev. Fr. Peter Khoat Van Tran on left, and (on far right, one of the Hostage Pope's wicked captors, Mgsr. Grone) at the Istituto Ravasco convent in Rome. Pope Gregory XVII in a series of clandestine meetings in the late 1980s told Fr. 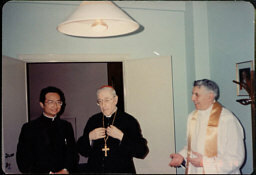 Peter Khoat Van Tran, a well-known Italian Prelate (His Excellency Archbishop Arrigo Pintonello), Monsignor Carlo Taramasso and a distinguished layman that the white smoke was not an error (mix-up), but indeed signified His election and acceptance as Roman Pontiff and that he was *under a decades-long death threat. Born. Giuseppe Siri, May 20, 1906, Genoa, Italy. Cardinalate. 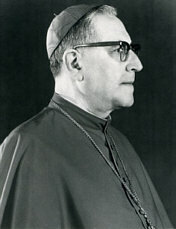 Created cardinal priest, January 12, 1953; received the red hat and the title of S. Maria della Vittoria, January 15, 1953. Papal legate to 4th centennial celebration of death of Saint Ignatius, Loyola, July 19, 1956; to religious celebrations of International Exposition of Brussels, Belgium, July 24, 1958. 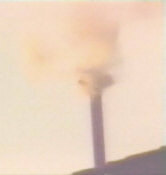 Significant Papal Action(s). 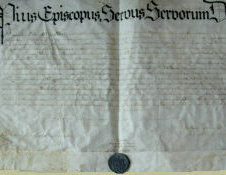 Created Cardinals (which included designation of a Camerlengo) to carry on mission of Church (Hierarchy) 1988. Formulated 'Continuance of Papacy Plan' 1988 to 1989 with Papal directive to *elect His successor promptly were he to die in unforeseen manner (*this occurred). Death. While in exile, May 2, 1989 Villa Campostano, Albaro, Italy.